It’s fairly obvious to sufferers that stress has physiological symptoms. 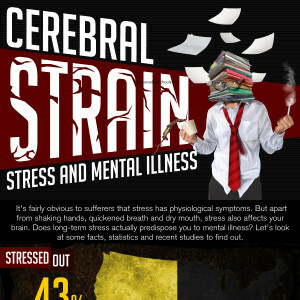 But apart from shaking hands, quickened breath and dry mouth, stress also affects your brain. Does long-term stress actually predispose you to mental illness? Let’s look at some facts, statistics and recent studies to find out. Post-traumatic stress disorder is unique in that it shows a direct link between extreme stress and mental health. PTSD often occurs with other illnesses such as depression, anxiety disorders and addiction. Multiple studies have shown a significant connection between stress and mental health. Main findings: Chronic stress creates changes in the brain that create a predisposition for mental illness. Main findings: Using mice, researchers found that extreme stress in adolescents can change brain chemistry to allow for the onset of mental illness. Main findings: Chronic stress may elevate levels of glucocorticoids in the brain. This reduces cell function and may lead to anxiety and depression disorders. … increase connectivity between the hippocampus and the amygdala, which affects a person’s fight or flight response time. … damage stem cells in the hippocampus that can later set the stage for mental disorders. … affect cortisol production in the brain, inhibiting an individual’s ability to cope with more stress. … negatively impact a person’s memory retention. … produce proteins in the brain that may lead to Alzheimer’s disease.